Sago Pudding Dessert made with pearl sago, coconut milk, palm sugar, pandan leaves, and water. Wash and soak pearl sago for 15 mins. Strain. When water boils, add pearl sago. Stir till pearl sago turns clear and transparent. Pour pearl sago into a sieve and wash under the tap to remove the extra starch. Allow pearl sago to set in rinsed moulds and keep in refrigerator. Boil sugar and palm sugar in water till sugar dissolves. Add pandan leaves and simmer for three mins. Strain syrup into a sauce boat or suitable container. Mix thick coconut milk with salt and strain into a sauce boat or suitable container. 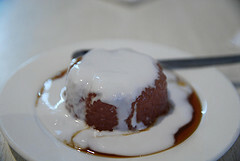 Remove sago pudding from moulds. Serve with syrup and coconut milk separately. Printable Version - Sago Pudding.